In 1988, the Zionist Organization of America commissioned this image to celebrate its 90th anniversary and the State of Israels 40th anniversary. City of Light was chosen by the U.S Post Office to illustrate a commemorative First Day Cover for a new Israeli stamp. Subsequently, Artscroll Publishers, a major Judaic press, requested permission to publish the design as a note card. The image drew a most enthusiastic response leading to the creation of this limited edition serigraph. Jerusalem is the City of Light which shines from the seven-branched menorah. The menorah symbolizes the six days of Creation and the Sabbath. 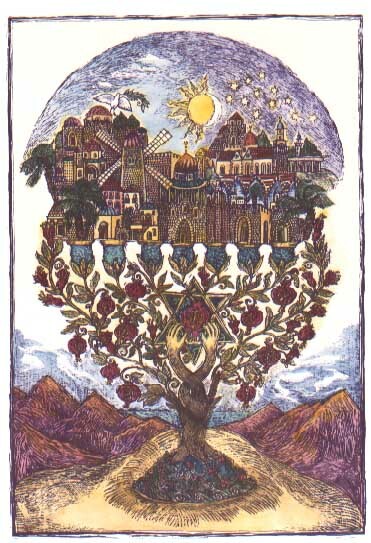 The ten pomegranates nestled within the menorahs branches signify a minyan (prayer quorum) and the twelve stars in the heavens above Jerusalem represent the original Twelve Tribes of Israel. The intertwined hands originate in a Garden of Eden at the menorahs base and reach towards a pomegranate in an eternal quest for peace and understanding through the performance of Mitzvot (good deeds). The pomegranate motif was chosen for its metaphorical value as described in the Midrash (books of commentary on the Bible). There it is said that the pomegranates 613 seeds correspond to the 613 categories of Mitzvot which guide our spiritual development.